I grew up wanting to be a spaceman. I didn’t say astronaut, and I didn’t say cosmonaut. When I was just getting old enough to dream about the future, neither of those words were in use. Spacemen were the stuff of fiction, and the stuff of the far future. The future arrived before I was ten in the form of Sputnik, an unwanted gift from the USSR that passed beeping over America and scared the whole nation out of its wits, and into a race for space. That was fine with me. I loved every minute of it, even though I knew I was never going to go. I was smart enough, and strong enough, but I couldn’t see across the room without glasses. Of course there were a thousand other hurdles I didn’t know about, but here we are talking about the dreams of youth. I followed the introduction of our astronauts, and learned all I could about the craft they would fly. There wasn’t a whole lot of information available in Talala, Oklahoma in 1959. Then, 55 years ago today, the Russians beat us into space – again – and in a much bigger way. Yuri Gagarin, cosmonaut, became the first human in space and the first to achieve orbit. Our guy Alan Shepard went up a few weeks later on a lesser flight, and America was outraged at the contrast. But for all my enthusiasm, there was almost no information about Gagarin’s flight. For nearly another thirty years, Russian triumphs and disasters would be hidden from the world. Now we know enough to appreciate Gagarin’s feat. The launch vehicle was an A-1, little different from the Soviet ICBM fleet, or the vehicle that launched Sputnik. Unlike the US, the Soviets have stayed with variations of a single workhorse vehicle through most of their space program. Also unlike American procedures, both Yuri Gagarin and Gherman Titov were suited up and ready at the pad, so that even in the event of a last second glitch, the launch would have been made by the backup pilot. The space craft was Vostok 1. It consisted of a sphere holding the cosmonaut and a separate life support module, a style adopted by the US during Gemini and Apollo. The launch was successful and only one orbit was planned. The Soviet style was to make many launches, each incrementally more daring than the last. 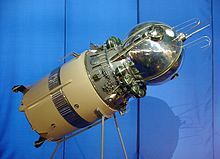 Unlike some subsequent launches by both countries, Vostok 1, possibly the most important launch in the history of spaceflight, went off without error. Russia had a large land mass, a small navy, and a penchant for secrecy. Consequently, all Russian missions landed inside the Soviet Union. Technology during the Vostok missions could not yet provide soft landings, so Gagarin and his immediate successors flew their missions on ejection seats, which they used after heat shields and spacecraft mounted parachutes had brought them near the surface and slowed them to a survivable speed. They completed their missions by means of personal parachutes. This entry was posted in A Writing Life and tagged cosmonauts, Gagarin, memoir, space travel, writing on April 12, 2016 by sydlogsdon.